The Marino Marini Museum which occupies the former San Pancrazio’s church in Florence, houses 182 works of art by Marino Marini (1901-1980) – sculptures, paintings, drawings and engravings – and promotes a calendar of events and exhibition devoted to contemporary artists, from the twentieth century until the most recent productions and themes. The collection is not arranged in a chronological order but thematically – the themes themselves are arranged not by iconographical representation, but rather by a state of mind – focuses around the large equestrian sculpture from the hague (1957-58) that stands at the center of the former liturgical space and is illuminated by natural light coming from the great absidal window. 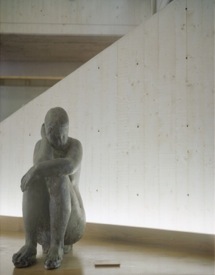 Marino marini considered natural light to be necessary in reading his own work. this principle is fully adopted and used in the museum: each piece has different possible points-of-view and the idea of “putting the artwork on a stand” – a concept so alien to marini’s poetics – is avoided.